The Martin 15 Series 000-15M looks like it came right out of the history books and it delivers a sound for the ages. In its 175-year history, Martin has set more guitar design trends than can be counted. The company still embraces design techniques introduced many years ago to create their guitars' timeless tone. The Martin 15 Series 000-15M offers a perfect blend of vintage features and modern technology to create an acoustic guitar of exceptional tone, playability and classic Martin good looks. Back, sides and top are bookmatched solid genuine mahogany with A-frame Sitka spruce X-bracing and a traditional maple bridge-plate. The 14-fret neck-also genuine mahogany-is joined with an East Indian rosewood fingerboard and headplate. The traditional rosewood belly-bridge is fitted with a bone saddle, and the nut is fashioned from bone as well. 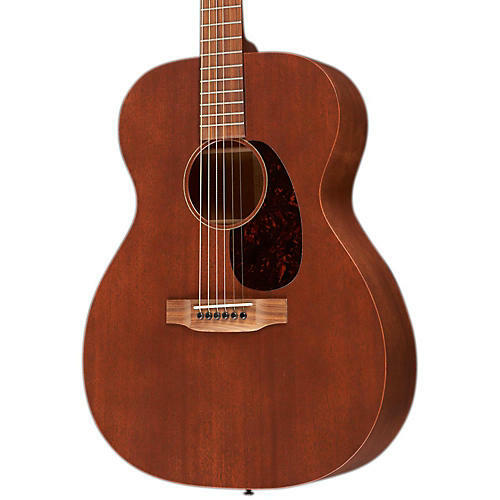 The Martin 15 Series 000-15M is embellished with a dark mahogany stain and a satin lacquer finish. The end result is a guitar of beauty and simplicity with a warm, rich mahogany voice. Includes case.